Since virtual life has been on my mind lately, I figured looking at social networking was apropos to the overall discussion. Quite honestly, it’s impossible to see, know, and experience the entire virtual world. It’s constantly expanding and growing and at such a rapid pace. Like others, it’s much more realistic to read and follow sites and/or blogs that hold one’s interest. Some time ago, I wrote the post, Paying my Respects to Kenneth Lo. He’s a phenomenal Bay Area artist and I’m a huge fan of his work. His Facebook statues regarding the arts (amongst other updates) are always these pearls of wisdom and truth so I couldn’t help but share one of his many witty updates. Although he has no intention of stirring emotions, his eloquent points always draw friends into a discussion (via comment thread) filled with humor and candor. Last week, he posted the status, “Sorry, this is rather bitchy of me, but it’s so very disheartening to see work that gets shown and celebrated, and think it to be so much gratuitous drivel.” I agree but it takes a brave soul to bring up such a point. When one feels compelled to re-visit an artist work over and over again it’s because the work resonates, which is a great thing! This happens all the time with music, film, performance art, etc. Yet, bad art (whatever that means to you) does exist. Being the die-hard optimist, I’ve said time and time again that the negative is just as valuable as the positive. Believe it or not, there is art I don’t like or don’t value (personally) BUT I try to understand its message or lack thereof to better understand my own notions and ideas of art. Bottom line: Art criticism and dialogue is imperative for its growth and evolution to take place. 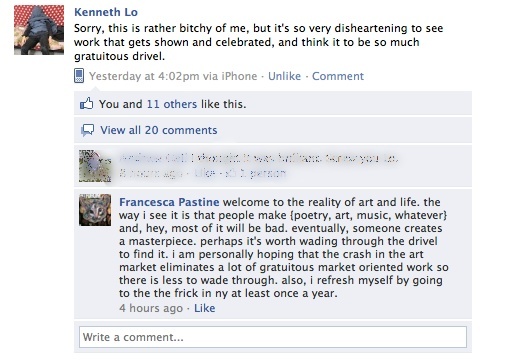 Posted in Art Writing and Criticism and tagged as art criticism, art vocabulary, art writing, postaday2011.